I know you’re reading this thinking: “Yeah right, and my neighbor’s cat flies around on a broomstick at night” ………..
Do those claims sound incredible, even unbelievable to you? If you are a normal, rational golfer of sound mind and body, they should! In fact, if I had heard this myself 5 years ago, I would have dismissed it as total hype and marketing and continued on my merry way of hacking, slashing, dunking, and destroying property as I used to with my old golf game. The great Ben Hogan said: “There isn’t a man playing golf today who couldn’t get to scoring in the low 70′s if he really tried.” (I will add woman to that quote as well). IT’S A FACT: Average Golfer Scores Have Not Dropped In Over 50 years, Despite All The New High-tech Equipment. Are You One Of Them? Are you shooting about the same scores as you always have, even 5 years ago? Unless you’ve been injured, THAT’S JUST NOT RIGHT! Because you follow the same old advice that’s given you the same high scores year after year with nothing but frustration!! Your Swing Is Good Enough To Score In The 70′s Right NOW! You’re just missing some other key ingredients. I mean think about it, you can make a lot mistakes in a round of golf and still have the best score of your life! There’s all kinds of room for your score to drop if you would just play the way you know how – at your potential best. Why do golfers spend so much time chasing the perfect swing when the great Jack Nicklaus says that golf is 90% mental? Jim Flick, the great instructor, followed that up by saying the other 10% is mental too! Everybody thinks that the only way to score lower is to buy the newest clubs, take continuous lessons, and practice for hours on end. Why? Because They’re Brainwashed By The Golf Industry! You know what? That way works if you’ve got infinite time and money to burn. But there is another way for PEOPLE WITH A LIFE! I replied to an email the other day to tell you that not ONLY did I break 80 after listening to your tapes for a week – I broke 70!! I shot a 66 on Friday, the 25th! It was an “out-of-body” experience! Absolutely fabulous! Everyone is pretty amazed by my 66 – including myself! …when Friday happened, I felt I had to give credit to your tapes. It was just too amazing for words! !I’m a member at Champions Golf Club in Houston, Tx and my handicap is 8. Aren’t you sick and tired of hearing that your score improvement is only another gadget or special club away? Who do you think pays for the ads that keeps the golf magazines profitable? I know folks that have dozens of these clubs and training aids gathering dust in their garage or basement and they keep buying more. Stop Being One Of The Sheep And Start Lowering Your Score, NOW! Have you ever had a great shot with each of your clubs? Well then, why in the world do you need to get new clubs? You don’t! You just have to find a way to repeat what already works – what you already know how to do – and have done in the past! Just try to get my old friend Joe at age 61 to give up his 30 year old Ping irons and he’d just as soon shoot you. That is, after he shows you on the course what the definition of “consistency” is in playing to his 2 handicap. If you could double the amount of great shots you’ve already proven you’ve had with your clubs and your swing, wouldn’t that cut your score dramatically? Today? What You Have Done Are Quite Brilliant! I have listened to all your CDs at least once and I am on the second listening. I have invoked a few of the critical messages and plan to continue to listen, study and incorporate this wonderful wisdom for months and years to come. I can say without doubt at this point that both you and what you have done are quite brilliant! I am playing a lot of golf and I FEEL your lessons and the subsequent changes I have invoked actually paying off and working. My last 3 rounds were 81 (3 – 3 putts), 89, 82. Most important, I FEEL the progress and tell you that it is very exciting. Many thanks! Ok, now I realize that this all sounds too good to be true and I don’t blame you for thinking that. But What is Consistency Anyway? How Do You Get It? You might think it’s nothing more than practicing…and you’d be wrong.There are thousands of talented pro golfers or wannabe pro golfers out there that hit literally thousands of golf balls a week in a vain attempt to have a repeating swing. They can do it on the range but when it comes to tournament time, or under pressure of a bet, they choke! And then there’s other golfers like Jim Furyk on the PGA tour or Bruce Lietzke on the Champions Tour, (who rarely practices and always plays a fade shot) who just keep on winning at the highest levels with their funky, awkward swings. Look at Lee Trevino. He taught golfers not to copy his swing because it wasn’t “correct.” Think he cared if it was correct or not when he was winning the U.S.Open or any of his other uh…66 victories? Dropped My Score By 8 Strokes To 79! “Craig, just a note to tell you that after getting and listening to your 4cd break80 program I started putting in my mind the thought that I can break not only 80 but 70. While I haven’t been at it a full 20 plus days to ingrain the thought, I played my first round today since getting your cd and dropped my score by 8 strokes to 79! Thanks. With your help and my mental attitude, I WILL BREAK 70! How Is This System Different Than Every Other Product To Get Your Scores Down? Good questions. The problem here for the golf industry is that what you will discover in this system, they can’t figure out a way to make big bucks on. There’s just way more money in selling gadgets and clubs. However, if you do the research, you will find many of the top pros and amateurs who have caught on and used these secrets to bypass other golfers with far more talent! It’s all buried between the lines of their books and polite interviews and they aren’t about to give up their secrets to their competitors. Look, I know where you’re coming from. I’ve been there. I struggled for 20 years trying to figure out this crazy game myself. I had subscriptions to 3 magazines, I read golf books, I took lessons, I blew thousands of dollars on clubs and gadgets, I hit balls at the range and practiced regularly…AND NOTHING WORKED! “I have had a few rounds in the 70,s in the six months or so since I got Craigs tapes, but I have historically been able to get at least one round in the 70,s for many years. Perhaps i am getting more but more importantly I am playing better when it counts now in tournaments and when there is something on the line. I won a calcutta event last fall which was big for me with a 77 (playing to a 12 handicap). I smiled a lot that day. I gave up the “game” of false hope. I instead turned toward what it is that really needs to happen in order to score lower – what I had already done before on many holes before, except now I needed to find out how to do it on 18 holes!Having pretty much figured that I was stuck to a life of shooting in the high 90′s with an occasional 80′s score, I didn’t bother to practice anymore. My life then was far too busy and chaotic to squeeze in any time on the rangeanyway. For the next 2 years, however, I DID follow these secrets of human behavior and performance and some key concepts related to how to most efficiently send a golf ball to a target. What happened next was almost like a miracle. I found some of the answers outside of golf and some within the teachings of obscure pros you’ve never heard of. I learned later that many other pros have gone that way before me but they weren’t talking! I had quit practicing, I cancelled my subscriptions. I ignored all swing advice from well-meaning partners… And only then did I scored in the 70′s! When I started scoring and playing better than I ever had in 25 years, I felt like I had hit the golf lottery! (Sure would like to actually know what it REALLY feels like to hit the lottery) What a relief! Finally, I really CAN PLAY THIS GAME. This System Is The Holy Grail Of Golf! “My drives are going further, my approach shots are straight as an arrow and my chipping and pitching are so accurate. P.S. this system is the Holy Grail of Golf This is it. This is the answer. Additionally, I was shocked that this could have happened during a period in my life that I was busiest than I’d ever been. During this time, I was working 2 jobs, we had our second child, we moved twice, I was taking computer courses at the local junior college, I was attempting to change careers with job searching and networking, and at the end of all that, I took a full-time job in a 12-hour-a-day management position at Fedex Express. With that job, I was lucky just to get in a round of golf once-in-a-while and had no chance of spending time at the range. AND YET MY GAME GOT BETTER AND BETTER! I will show you how you too can EASILY & EFFORTLESSLY work on your game in your in-between times, while playing on the course, at the office, while driving in your car, while watching TV in your living room, even while falling asleep at night! Within One Week I Shaved 10 Strokes Off My Scores! “Within one week of listening to Craig’s Break 80 CD’s, I shaved 10 strokes off my scores, and have improved on that consistently since. This season, I fully expect to break 80 for the first time. Amazingly, I turn 50 this summer. If you read and act on my program, you will lose 8-10 strokes off your golf score…within 30 days. And it won’t involve hours of practice. Guaranteed. Period. End of story. No hype, no bull, no emotional garbage just to get you to buy knowing that only a small percentage of people actually follow through with returning a product even if they think the product stinks. I’m not interested in “playing the numbers” like those guys. I’m interested in racking up real stories of average men, women, and children who will use (not just buy and throw on the shelf) this information to make their life a little bit better by enjoying golf more than they ever have when they break their personal scoring barrier. Heck, if it were up to me, I’d give this stuff away (my accountant says no way) as I am having a blast just continuing to search and test out all that is good and bad in golf instruction. Don’t look so shocked, it happens all the time when one person starts to play that much better than their golf partner. They feel threatened by the fact that you’ve left them in the dust with your new game. But you can hang onto them as long as you are humble about it. It’s the best thing I’ve ever done for my game. I’ve taken lessons with absolutely no benefit. Now I enjoy the game more and play better. C’mon, Everybody Knows That You Have to Practice to Get Better at Anything, Right? Now, I’m not gonna say anything here or in my program that leads you to think that practicing your golf is a bad thing. In fact, I am a strong believer that good practicing can and does pay off in lower golf scores. The problem with most golfers is they practice the wrong thing or work on a swing method that doesn’t fit them. They try to force that square peg into the round hole. What I am saying, though, is that the old way for golf improvement (lessons-range-hacking) we have all come to know, love, and believe isn’t the only way to turn into a good golfer! Many times I can hear the cussing as well! It doesn’t have to be like this! BUT IT IS! Instead of trying to remember all those checkpoints and arms and legs straightening and bending and weight transfers and shifting and twisting and X factors and swing planes and on and on….geez, gimme a break! All you need are 2 concepts about the swing that all great golfers use (whether they know it or not). You do these 2 magic movements and the ball HAS TO GO STRAIGHT. IT’S PHYSICALLY IMPOSSIBLE FOR THE BALL NOT TO GO WHERE YOU AIM IF YOU DO. And it’s so easy it’s scary. You’ll be angry you that you didn’t think of it before. When you understand these swing secrets, and the method for using them, you will be able to teach a complete beginner how to play decent golf within an hour. And yet, most of us average golfers think that we are just a few more lessons and a lot more practice away from reaching our scoring dreams or, even more sadly, some of us think we can NEVER get any better. It’s so pitiful! Had My Best Ball Striking Round! I know what it’s like to work 60 hours a week and then come home and have even more to do. In the last few years, I have spent almost all of my free time (what little there is) on researching and applying knowledge gained from teaching pros, golf researchers, sports psychologists, and golf’s greatest champions in interviews, books, magazines, tapes and videos. I even pretty much gave up watching non-golf TV I’m so hooked. I’ve collected all this info and then squeezed it down to the necessaries for the average golfer who just DOESN’T HAVE TIME TO PRACTICE! Because I am an expert busy person like you. What?… You Do Have Time to Practice? Then You Can Expect Lightning Improvement In Your Game! THAT’S GREAT! You are definitely one of the elite few that knows the value of effort and your own powerful mindset. You will now know how to make your practice actually make your scores go down instead of just ingraining your old bad habits! YOU WILL SUPERCHARGE YOUR TIME SPENT WORKING ON YOUR GAME!! Why should you believe anything I say? My answer to that is: DON’T! (5 years ago I wouldn’t have believed all the things I’m saying here either) But you can believe the folks that have ordered this system and LOWERED THEIR SCORES! “Last year my game became so bad (shooting consistently over 100) that I seriously considered giving up the game for good. Since I’ve been exposed to Craig’s Break 80 Without Practice program, I am lowering my score week by week. I’m currently shooting in the low 90′s and fully expect to knock another 8 to 10 strokes off my game this year. Botttom Line: What Do You Get in This System? Craig Sigl’s world famous “Golf Without Practice” in affordable ebook format AND in .mp3 audio format. Instant Download! As you know, there is an avalanche of golf info out there and it seems like I will read one article with a pro saying one thing and then another tells you to do the opposite! Can you say C-O-N-F-U-S-I-O-N ? What secrets will be revealed to you in this ebook? Why your scores refuse to go down and THE ONE NECESSARY STEP to turn it around before you do anything else. It took me 10 years of failure to figure out THE 2 most important concepts that are all that’s necessary for the physical swing. The 3rd was to ignore everything else! How ordinary people will teach you how to have extraordinary success on and off the course. The only swing aids you’ll ever need, that cost less than a pack of tees. Save money and ignore the infomercials. What golf ball makers pray you’ll never find out. You’re probably playing a ball that costs you distance and hurts your score. What pros know about how to use your body that amateurs don’t. The 3 things Golf Psychologists teach that Golfing Potential is determined by. The simple, forgotten, 3-step swing method taught by an ex-PGA pro that you can use to tune your swing or teach a beginner from scratch. The Consistency Formula”: Less than 10% of all amateur golfers have a clue. You can be one of them. How to program in a repeating swing in your automatic functioning, the same as your heart beating. You’ve heard it said that we only use 10% of our mind power?How to tap into that other 90% like geniuses such as Thomas Edison, Mark Twain, and Nikolai Tesla did for intense mental toughness. How to activate that part of your brain that is responsible for 95% of your mindpower and skill to turbocharge your Score reduction mechanism. Secret to do what John Daly and Nicklaus give the most credit to for their major and tour wins. How to create a cybernetic guidance system that will lock you onto the best golf score of your life like a surface missile homing in on an airplane. Make golf more fun than anything you ever did as a kid playing with your friends. Jealously guarded Secret Methods derived from scientific lab experiments for laser-guided accuracy Without Needing to Hit a single Practice Ball! Dynamic, magical psychological techniques to enter “The ZONE” – at will – like switching on a light. A completely natural way to banish Fear, Anxiety, Worry from your game and replace them with Power and Strength for explosive distance. Exactly how to make watching a golf tournament on TV produce more good shots for you than another lesson. How you can use Classified training techniques the Australian Institute of Sport taught it’s athletes to increase it’s Olympic medal count from 14 to 58 at the last games. Learn to use the mesmerizing mind training methods that Zen Master coaches, like Phil Jackson, have dominated their sport with. WARNING: Avoid the mistake that many golfers make in attempting to relax that actually causes more tension! Did you know that Tiger Woods has seen a hypnotist since the age of 10? Or that Ken Norton used hypnosis training to defeat Muhammed Ali (and break his jaw) in 1973? Find out what you need to know about this exploding modality. My number one method to learn zombie-like focus and concentration, whenever you need it. What to do when you have all those cancerous thoughts flying around your mind and destroying your swing. An advanced lesson to get the benefit of hitting range balls for 2 hours…in only 2 minutes! Speed up your progress by utilizing Accelerated Learning techniques first used by Soviet athletes to dominate the Olympics for 30 years, until the West finally caught on. A simple and easy trick to use the major mental key Byron Nelson used for his longstanding record of 11 straight wins. The number one reason why amateurs cannot bring their range warmup swing to the course. The quick and easy 5-step process to make it happen. A detailed explanation of the mind/body connection and why you must be in total control of these processes to exterminate those balloon-score holes. Astonishing secrets to score on the back 9 as well as you did on the front nine, and vice versa. A proven way to dissolve nervousness and play at that optimal “relaxed awareness” state first described by Tim Gallwey in his classic Book: Inner Golf. What you must do before a round even before you get to the course to become an intimidating competitor. The Universal truths of evolutionary human behavior that you can take advantage of to switch on your unconscious processes to feel unbeatable on the first tee. The deadly mental mistake most amateurs make while playing that is like driving with your parking brake on. Have you ever heard that you must play each shot in the present? Or one shot at a time? Easier said than done right? Well, here’s a specific set of tools for you to do that. What to do when you show up at the first tee right at your tee time with no warmup. 3 pro-proven ways to turn worry and expectations into that loose, carefree, underdog feeling…even if you are the favorite! Stop throwing away those first few holes before you really start playing. How to use your business skills to turn anger and frustration to your advantage to stop having those double bogeys and worse. The amazing little-known secret to the first ever PGA tournament score of 59 and how to get it. Hale Irwin said it should be the number one thought on the mind of all amateur golfers. Use Tiger Woods and Greg Norman’s tactics to shut down that little voice inside your head that constantly questions your own abilities and decisions on how to play the next shot. Have you ever chosen a club for a shot but weren’t sure if it was the right choice? And then found it definitely wasn’t? I’ll show you how to get out of that trap forever. Fact is, the people who are helping me with this project are telling me that I am giving you too much! They say to hold back some info and make you want to come back for more…I just can’t do that and am giving you everything!! 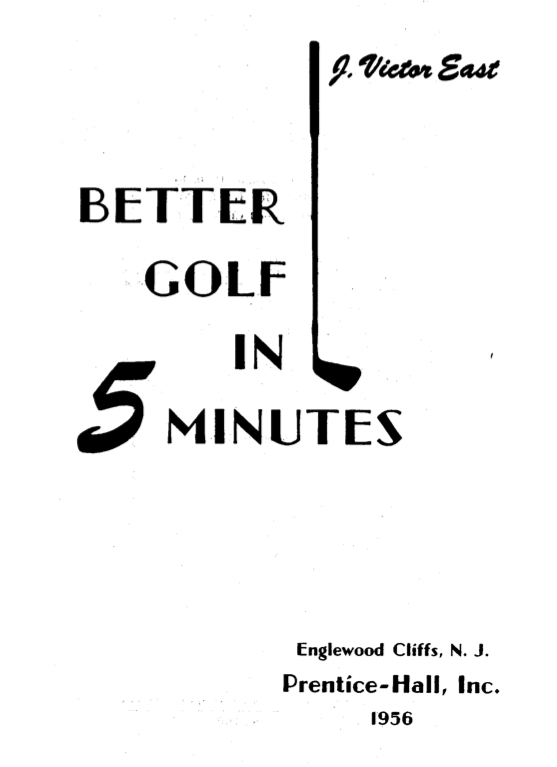 Premier Membership in My “Online Classics” Golf Book Club. Now at: 11 Golf Ebooks! Chapters on: Erroneous theories, The golf shot, the golf stroke, Body action, Footwork, Basic ideas, Clubs, Slicing and hooking, Unusual shots, Lefthanded golf, Women’s golf, Common faults, Golf research, Harmful golf theory, Mental side of golf…and more. Former President of the PGA. Chapters on: Club design, The basic movement, club fitting, Evolution of equipment, Grip, Aiming, Swing pointers, From practice to a round, Accuracy, Hooks and slices, temperament and touch in putting, How to teach others, Scoring. East was a master club builder. Chapters on: Mental approach, The hands in the swing, Stance, Backswing, Driving, Swing finish, Club choice, Long irons, Mid-irons, Short irons, Around the green, Putting, Trouble shots. This book was written at the height of Palmer’s career and includes many swing photos. Chapters on: Shotmaking with all clubs from these Golf Legends: Snead, Middlecoff, Mangrum, Souchak, Armour, Stranahan, Ford, Bayer, Demaret, Furgol, Sarazen, Bolt, Boros, Toski, Fleck, Littler, Burke. Jackie Burke jr Chapters on: Grip, Address, Consistent putting secrets, Chipping, Swing pause secret, Footwork, Woods, Slice cure, Starting a round, Short game, Shot creativity, Trouble shots. Chapters on: Driving for distance, Fairway shots, Chipping/Pitching, Putting, Trouble shots, Weather variables, Competition secrets, How to practice, Golf gear tips, Women golfers, Conditioning for golf, Gary’s thoughts on golf. This book is part instruction, history, adventure, humor and stories from the great Sam Snead. Sam is quite entertaining in this book telling all about his many tour victories and some tough losses. He gives you lessons with his stories and sometimes directly. He covers all the major aspects of the game throughout the book. You will get to know the real man, Sam Snead through reading this book and also learn how to improve your game in the process. 245 pages long, a classic must-have for any golfer. This book has been written for beginning golfers and those with some experience that want to improve their game and shoot lower scores. It is also an excellent guide that shows you how to avoid high scores (double bogeys or more) and disappointing rounds. Applying the secrets in this book may not be enough to get you ready for the P.G.A. Tour, but you’ll start playing your best golf ever and may just be smiling on the links much more often! Hi I ‘ve just purchased your ‘ no practice ‘ system. I haven’t received it yet as it was only ordered a couple of days ago. I’m writing mainly to thank you for the free E- books which are part of the package. An unbelievably powerful book that will not only help your golf, but will supercharge your life! Stop taking advice from well-meaning friends and get it from those who have ALREADY MADE IT TO THE TOP! This book is beyond fantastic…I have acquired the full legal rights and am able to pass it on to you. You will have full legal rights to copy or send this book to any of your friends or family so that they too can benefit as a few lucky folks who have found it already have. Let it change your golf and life for the better. Listen, I hesitate to mention this, but many of the concepts I’ve discovered and pass on to you in this system are not just unbelievably potent for your golf game. Many buyers have told me that much of this information and the changes it sparks in them has improved OTHER AREAS OF THEIR LIFE, like relationships, career and money. I’ll just leave it at that for now, you’ll have to discover that for yourself when you order. then request a refund within 8 weeks and get your money back. I’m that sure of this! Clickbank handles everything easily and seamlessly. You know what? I don’t blame you for asking since I’d be thinking the same thing if I were you. But I learned in my NLP training from very successful people that to get the right answers, you have to ask the right question. We call this “Reframing” and we use this technique in the program. What’s it gonna cost me if I don’t give this program a shot? More frustrating rounds and $200 clubs broken in anger? Multiple $100 swing gadgets gathering dust and piling up in your garage? More lessons that didn’t seem to work the last time you took them? At $50 a pop or more. $100 wasted green fees for rounds where you stunk and wished you’d stayed home? Your , valuable time spent on the practice range bored to tears? This whole program is about you and your enjoyment of the game and all that means to you, namely: lower scores, right? There are countless ebooks, videos, and swing programs out there to help you with your golf game that range anywhere from $10.00 to $500.00. Or, you can sign up for another series of lessons with your local pro setting you back $300.00 or more. But I’m not interested in giving you the same-old same-old. You could have gone out and gotten that yourself already. But, you know deep down, that you need something different, something more. Something powerful. Something that will make your game take a quantum leap, huh? So, What is it Worth to You to Be Able to Take That Quantum Scoring Leap Without Cutting Into Your EXTREMELY VALUABLE Free Time? The Total Real Value of Everything You Get Here is an astounding $474.00 . “Isn’t Your Enjoyment and Time worth WAY more than that? P.S #1 Where have you ever found any golf advice anywhere that says you can slash scores, as easy as using an eraser on the card, without practicing for hours on end? And backs it up with a solid 8-week guarantee? AND YOU GET IT INSTANTLY AFTER PURCHASE! NO WAITING. You get: “Break 80 Without Practice” ebook program. The Online Classics Golf Book Library, , “Inside the Minds of Winners” ebook, The Member’s Site with articles and ebooks, ….AND LOWER SCORES! P.S. #3 What are you waiting for? Oh I know, you don’t want those bonuses huh? And you want to see another 100 or so Testimonials of folks who didn’t miss out so that you can pay more later huh? P.S. #4 I bet some of your golf partners wish you’d do something too so they don’t have to hear you whine and complain about your game anymore wouldn’t they? Start scoring lower now and making every minute of playing golf like you’ve died and gone to golf heaven already!! “Break 80 Without Practice has been a God-send for me. I listen to almost everyday in the car. Two years ago I had trouble breaking 120 but the end of last season when I began listening to you Craig I broke 100 a couple times and this year my first time out here in cold Michigan I only played 9 but shot a 49 and a couple weeks ago on the same 9 hole course I shot a 44. I’ve only been playing golf for three seasons and I’m 64 but thanks to you Craig I’m really enjoying the game a lot more. with a credit card or Paypal account…it’s less than a new club or a wonder gadget on a TV infomercial. Last Chance! Don’t Hate Yourself For Missing Out on this Rare Opportunity to Finally Break Through Your Scoring Barrier and end the misery and frustration forever!